May 17, 2013, by Kurt Davis Jr.
Ethiopia, its culture and people have been part of my life for many years. But it is different every time I come here and it makes me realize how little I know about this country. It is most probable that if you fly to Addis from another country, you will arrive at night and your first glimpse of the city will be at its dark side. Do not pay too much attention to your first impression. It will get better when the sun rises. Not many people appreciate the capital city of Ethiopia and many tourists try to escape from there as soon as possible. Of course it is not easy to see the best of the city if one is in a rush. The city is like a woman whose charm you are able to see only after a while. It does not strike you at the beginning but soon you are under a spell and have no idea how it happened. It is bit over a hundred years old. But this doesn’t mean that the mystical Ethiopia is not there. And it is worth taking a risk to try to make friends with Addis Ababa. When Menelik, the powerful king of Showa, whose aim was to rule the whole of Ethiopia moved into the area of today’s Addis Ababa, he settled on Entoto, a mountainous province of the country. He was accompanied by his wife, Taitu. The couple were powerful, perceived by their subjects as beautiful and divine. Moreover, Menelik and Taitu had a blueprint of how to rule the country. When they settled on Entoto they were already on their way to fulfill their dreams. Not much later Menelik was crowned niguse-negest meaning Emperor and Taitu was crowned Itege or Empress. She was not only the Emperor’s wife, but also a crowned wife, an Empress with her own rights. The couples influenced Ethiopian fate in almost all of its aspects. The administrational and geographical shape of the country changed completely. What was old Ethiopia constituted one third of the area of the country in its new shape. The couple also realized that contrary to Ethiopian tradition, they need a permanent capital, a place to settle and to rule. Entoto was good, but not perfect. Cold at night and dry. Taitu used to travel down the hill to cure her aching back in the hot springs of Fil-wo-ha. It was her idea that the lower plain was good not only for her back but for a permanent settlement too. It was then that Menelik and Taitu decided to put up their tents and grow Addis Ababa (the new flower) there. It is good to go to Entoto when you are in Addis. The view from above shows the city in a completely new perspective. It is quiet, without smoke with no one to bother to you and you can enjoy the eucalyptus forest and the breathtaking view over Addis. There are also two churches on the hill, Raguel Church and Entoto Mariam Church. Both of them are reminders of the imperial couple. One was founded by Taitu and the other by Menelik. Both are splendid but there is something extraordinary about the one founded by Menelik – the paintings. Actually, whichever church you visit in Ethiopia, the churches and their murals do not let you leave before you carefully study each and every representation. Aba Lukas who painted the murals of the church was an Ethiopian monk from Gonder. A very talented monk, whom I deeply believe one day art historians will admit into the gallery of the most remarkable artists somewhere between Bosch and Broughel. The marriage between Ethiopia and her coffee has been hailed by many to be the best in the world and with an Italian style. Italians occupied Ethiopia for five years (1936-1941) and whatever harm they did to the country, they also left a bit of their habits behind which turned out to go very well with Ethiopian habits. Coffee places are the best example of this combination. There are a lot of places to be visited in Addis, providing that you do not run away from this place too soon. Churches each with their own spectacular history and some of them witnessing the most spectacular moments of Ethiopian history. Like the coronation of Haile Selassie I or another one ‘Selassie Cathedral’ which places the Emperor’s body buried in the year 2000, twenty five years after his death. 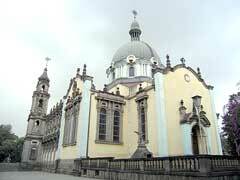 From the three imperial palaces in Addis, only one can be visited. The first palace of Haile Selassie I has been housing Addis Ababa University since 1960. After a failed coup d’etat which was supposed to deprive the Emperor of power, he offered this palace to the University and moved to the new one. Now it is one of the governmental buildings. 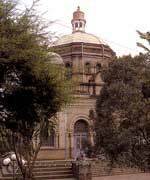 Unfortunately, neither the old Menelik’s Palace located next to the Menelik Mausoleum can be visited since the office of Prime Minister has its seat there. Churches are not everything and being a typical tourist it is good to learn a bit and visit some museums. In Addis there are quite a few of them. The National Museum with a replica of Lucy is the best known but there are others, like Addis Ababa Museum. 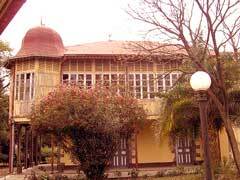 The building of the museum is an old residence which allows visitors to imagine Addis Ababa’s aristocratic life style from before. A mug of Menelik, one of his daughter Zawditu and lots of pictures are there. If someone doesn’t find it fascinating, it is better to stay in the nearby Meskel Square where huge white pigeons have been constructed to meet the New Millennium. According to the Ethiopian Calendar year 2000 has started on the 12th of September 2007. Addis Ababa is a very joyful place with some quarters even more joyful than others. Piazza, the center has the most shopping and nightlife areas and used to be called ‘Arada’ before the Italian occupation. Now it is a name which is only inserted in some lyrics referring to the busy district. There is another part of Addis that is now struggling to be the most occupied place on Saturday nights. Bole, a district spreading towards the airport is full of modern shops, restaurants and busy night clubs. The list of bars which are recommended by those who know it well will keep you there for the whole time. At Piazza you feel more of Ethiopian life-style in comparison to Bole; especially, if you decided to stay in Itege Taitu Hotel. 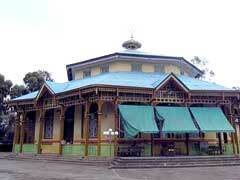 It is the first hotel in Ethiopia founded by Menelik’s wife. It is still offering something of the feeling of an imperial era in a very shabby, yet charming style. It is like one of those places which get old and fall apart with dignity. Crowded streets and people calling you is what imagination brings when we think about African cities and Addis Ababa is no different. Ethiopians often talk freely to each other no European standard of pretending that we don’t see each other. And foreigners or ‘ferengi’ I say this because it is a term applied by Ethiopians for foreigners. It is not meant to be offending even though some ferengi may feel like killing the 100th person who has called them by this name on the street. It can be tiring when used a lot, but this is one of the cultural differences that we want to experience as we travel. It seems ridiculous to complain. This is one place in Addis that missing it would be a big mistake. Not only for shopping but for visiting, seeing, smelling and touching. Merkato is a place that you will love to go back to. It is one of the biggest market places in the world. It is a whole district with a huge number of tiny streets, big and little shops offering you anything you want. As in all traditional markets, each profession has its own sectioned area. You walk through sellers offering a variety of strange parts of odd machines, threads, garments, fruits, spices, colors, aromas, and you see the people excited, smiling, talking, touching …etc. Touching is also a way of noticing…another piece of culture that we come to experience. One may ask how many days are needed to enjoy Addis before getting tired of the crowds, cars and smoke. I say, for some two minutes might be enough while others believe that this is the place where they may find a sense for their lives. But all are tempted to go further to explore Ethiopia out of its capital. Of course whatever you may find in Addis, the real experience and real Ethiopia is waiting for you when you leave the city. But what can be a big surprise is that when you return to the city before your next trip or to fly back to your country, you realize that you feel at home there. The man at the corner who is trying to sell you pots from Gambella even though you bought two from him already, seems to be your old friend. It does not matter how ugly Addis Ababa may seem to be for some, you like it more as time passes by. Dr. Hanna Rubinkowska has plenty of travel experiences to Ethiopia and is a contributor to our site. She has specialized in modern history of Ethiopia and currently lectures at Warsaw University, Department of African Languages and Cultures.